Sick of fungi yet? Too bad, here is some more! Went on a short forage with Nick yesterday and this time really climbed around in the brush, bushes, and trees. Hopefully no poison oak shows up on our bodies. So far, so good! We found two ridiculously cute mushrooms and both are smaller than my thumb! Russula emetica - this one even has a tinier mushroom next to it! Boletus zelleri - aka Zeller's Bolete. Strikingly beautiful little shroom. We also found tons of these polypores devouring a fallen conifer. Fomitopsis pinicola - aka red-belted conk. I'm still looking for an artists conk to doodle on! See what I mean here. These candy caps were the best find of the day! They're weren't very many, but there were enough for me to take home and dry. They smell like an earthy maple syrup when dried and they're quite tasty. 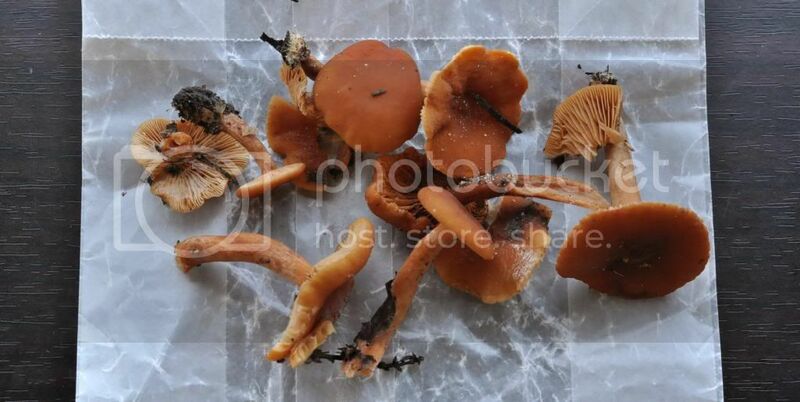 Lactarius rubidus - aka Candy Caps! Posted in "Fungus Identification", "Nikon D90", "Santa Cruz", "fungi", "mushroom"